If you are a T.V serial lover then how can you forget the high rated serial the Punisher? This famous serial was released in November 2017. The Punisher is an American web television created by Netflix which was based on the Marvel Comic character. Frank Castle who acts as Punisher is the main character of the serial. He aims to fight the criminal underworld by any means necessary, no matter how lethal the results. In this serial, Frank Castle used to wear Jon Bernthal the Punisher Black Jacket and Frank Castle Punisher Black Cotton Jacket. These jackets have multiple guts to show their elegance that was always in high demand. What you put on is the way you gift yourself to the world, especially nowadays, while human contacts are so short. The style is instant language. Fashion is something that everyone has; all we need to do is to discover it. 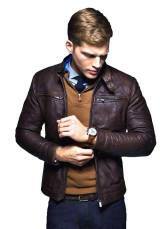 William jackets firmly believe that with the right and quality dress you can rule the world. Fashion is the only factor you couldn’t purchase. It’s not a purchasing bag, a label, or a rate tag. It’s something contemplated from our soul to the outside world. Jon Bernthal the Punisher Frank Castle Black Jacket and Frank Castle Punisher Black Cotton Jacket are high-quality jackets that made up of cotton fabric with lining interior inside. Inside the story of “The Punisher”, after the murder of his own family, Marine veteran Frank fort becomes the vigilante called “The Punisher,” with most effective one purpose in mind: to avenge them. After exacting revenge on the ones liable for the demise of his wife and kids, Frank Castle uncovers a conspiracy that runs far deeper than New York’s criminal underworld. Now regarded for the duration of the town because the Punisher, he should find out the truth about injustices that affect extra than his family. Supporting the vigilante in his quest to fight criminals are great buddy Billy Russo, who runs private military agency anvil, and previous NSA analyst micro, who shares not unusual enemies with a citadel and facilitates him as a part of a so-known as a marriage of comfort. Billy Russo is Castle’s former friend when he served in USMC Force Recon. Dinah Madani who is an American- Iranian agent stationed in Afghanistan, who is returned to the New York City for an investigation that leads her to cross paths with Castle. Overall it’s been a highly rated T.V serial since it was released due to its strong story and bold characters. Show your love with “The Punisher” by having Jon Bernthal the Punisher Frank Castle Black Jacket and Frank Castle Punisher Black Cotton Jacket. No superhero, yet a screw-up – that is the Punisher. What's more, he's a person you would prefer not to meet in case you're on the wrong side of the law. The Punisher false name Frank Castle was a profoundly enlivened U.S. Marine with a spouse and two children. Amid a pick nick, his children unintentionally saw a Mafia murder. Since the Mafia is no aficionado of observers, by and large, the killers simply shot down the entire family. Be that as it may, Frank Castle endures, swearing bleeding revenge on the murderers of his family as well as on all culprits. Along these lines, he turned into the Punisher. He chases down the miscreants with each conceivable means: seizing, extorting, tormenting, murdering – self-justice with advantages as it were... In the same way as other others, the Punisher is a legend without superpowers. He can just depend on his military preparing for his fight against wrongdoing. He is an ace of close battle, disguise, vital arranging, and can skillfully utilize differing weapons. What's more, since he's such a savvy ace of military strategies, he wears this gigantic white skull on his shirt. The awful young men shoot naturally at the image on his chest, which is protected by a slug verification vest, and don't go for his head. Clever! In any case, aside from this capacity, the thing just looks boss wickedness. First time ever appeared in a super hit character Spider-Man comic. The Punisher character was gotten extremely well by the pursuers appropriate from the begin. During the 70s, he had either infrequent visitor appearance in different Marvel Comics until the point when he got his very own arrangement. 2004, the account of this screw-up was adjusted to a film with Thomas Jane as the fundamental character. The performer prepared seven months with the hardest warhorses of earth, the U.S. Naval force Seals, for his job, picking up 20 pounds of muscles – and he wound up like the ideal Punisher. It is safe to say that you are a Punisher fan, as well? William Jacket has precisely the correct Punisher Jacket for you in our Online Shop: A the Punisher jacket with the characteristic of real Punisher jacket at the front and the back. You will find it the real adaptation, even not just its looks, but also you will feel the safety while wearing it because it has the true outlook as it was shown in Punisher.